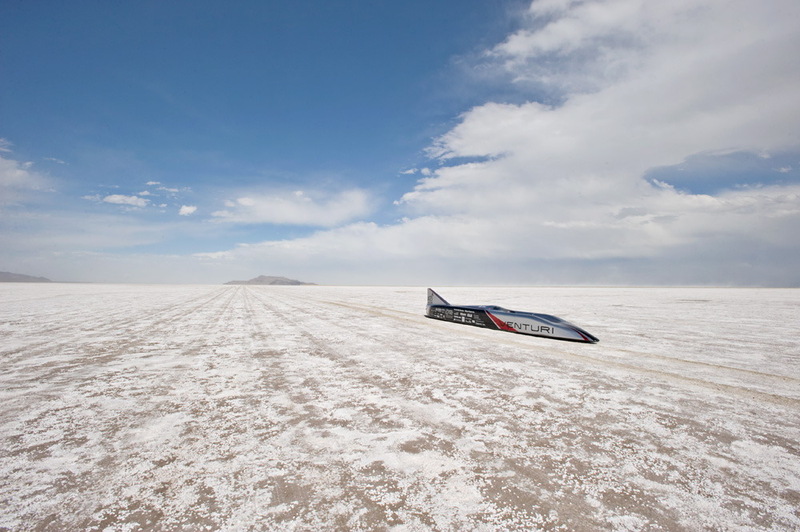 The Venturi sponsored Buckeye Bullet, an all-electric landspeed racer built by students at Ohio State University, set a speed of 307.66 MPH in the mile this afternoon at the Bonneville Salt Flats — and they're going again. Using a slightly modified version 2 of the streamliner, the VBB 2.5 uses the same powertrain as the previous VBB2 but with the Hydrogen Fuel Cell used to set a world record of 302.877 MPH now replaced with prismatic battery cells supplied by A123 systems. The team haven't going public with battery pack details but it has been reported they are using 1600 prismatic cells and we know they are sponsored by A123 systems. From the A123 web-site their cells are 3.3v @ 20Ah so 1600x gives approx 100 kWh. The steel box tube framed and carbon fiber enclosed car is powered by a custom built 3 phase AC motor with a claimed 700+ horsepower (514 kw), driving the rear wheels via a slightly modified (longer final drive ratio?) 6 speed transaxle. The team holds a US electric powered Land Speed Record of 314.958 mph set in 2004 with the original Buckeye Bullet using a 400 hp (300 kw) 3 phase AC motor.